Reprint. Originally published: United States: Timbuktu Labs, Inc., 2016. 'The definitive book of the year in our house, for both parents and offspring' Maggie O'Farrell, Guardian Books of the Year'Absolutely beautiful - get one for yourself and one to inspire a woman in your life' Stylist*Sunday Times and New York Times bestseller**Blackwell's Book of the Year**Foyles Children's Book of the Year**Shortlisted for Waterstones Book of the Year*What if the princess didn't marry Prince Charming but instead went on to be an astronaut? What if the jealous step sisters were supportive and kind? And what if the queen was the one really in charge of the kingdom? 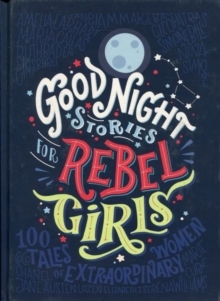 Illustrated by sixty female artists from every corner of the globe, Good Night Stories for Rebel Girls introduces us to one hundred remarkable women and their extraordinary lives, from Ada Lovelace to Malala, Amelia Earhart to Michelle Obama.